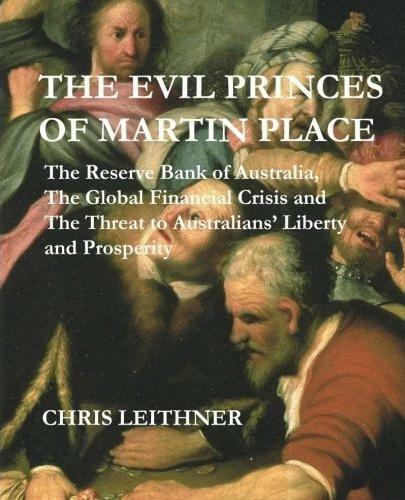 Buy The Evil Princes of Martin Place to understand how the Reserve Bank of Australia is stealing your money and creating financial crises. Written by one of Australia’s leading Austro-libertarians, Chris Leithner. Leithner is firmly within the Austrian School of Economics, which boasts luminaries such as Nobel laureate F.A. Hayek and respected economist Israel Kirzner. I’m writing a review of the book which I’ll post up soon. The book can be purchased through Amazon.com by clicking here. But, Sukrit, what would we do with the Reserve Bank building? doesn’t Sydney already have enough office space? Shouldn’t Chris be declining fiat money in exchange for his book if we are to take him seriously! Presumably he believes that he can exchange the fiat money for something that is actually of value at some future date. Even if we did end Government printing of money I seriously doubt that Australian Dollars would lose all their value at the same time. Of course this leads me to wonder how we’d move away from Fiat currency. One thing you could do would be to allow individuals and banks to print their own currencies (which is currently illegal), and then start accepting some or all of those currencies for payment of Taxes and Fines. If the government stopped making money at the same time people would naturally start moving to the new backed currencies. I’ve sometimes wondered how far you could get away with structuring trade in terms of bets, or wagers. If I were to bet you one gram of gold that you wouldn’t work as a labourer for one day, and did that each day, is that a wage or a wager, legally? If enough people just swapped, using metal where goods weren’t available, and didn’t bother to inform the powers of Taxation, we might be able to grow a replacement system under the noses of the governments. (ii) having involved particular action by a particular entity (whether or not the event actually involved any action by that entity). What I’d like to see is you justify your irrational money-communism Kirchner. Learn economics. That someone has written a book on this topic, and with the right attitude, is the best news. This fact, and the meeting that Sukrit has called, are landmark events. A reason for optimism, in a pretty bleak set of circumstances. Naturally the book is on its way to the current Bird citadel. What is the point behind this jibber-jabber Mark? Bear in mind that in the last thirty years the Reserve Bank has stolen more off us, then the Egyptian President has stolen off his people. The point was Nick has no way out of avoiding the GST, because the Act proclaims the Commish of Tax. to have divine powers. Right. Thats real relevant to the thread ……. (not). Something that is indeed relevant to the thread is that I’ve been lecturing you and others on the subject of the book since 2006 now, and you were too dimwitted to understand. Thats pretty flat learning curves if you track it on a graph fella. Too late for catch-up now. My name should be ‘Nuke’, please, Lord Lucan! Or do you want us all arrested? If the Tax commissioner has all these powers, then by blackmailing the Tax man, we could free up the whole country! Or by getting a libertarian into this top job! Anyone good with disguises? What does the current Tax Commissioner look like? By lecturing if you mean “disjointed, incogent ramblings” then you are correct. No one bar you and a few nutters with a bigotry against bankers wants to institute a 100% reserve regime. It’s unworkable, illiberal crap and stems from the worst of Rothbards ideas, like how insurance slips are money. You’re an intellectual lightweight who has been proven wrong so many times on both your claims and theories. Six years and you still don’t understand monetary economics. I can see that the tables are set. The speakers are geared up. The microphone is plugged in. The powerpoint presentations are ready to fly. Even the fashionably late guests are already in the house. And you aint there. On account of you being too stupid. Five years is long enough to learn monetary economics. If you haven’t sorted out the subject by now you are never going to sort it out and you aren’t the right material even if you did. Remember what Sukrit said about egalitarianism. No charity where the stupid like you are concerned … if I may be so bold. I’m reading this book right now. Its a sensational book. Everyone ought to buy it.